"Louise Bourgeois: Porcelain Contemporaines," Connaissance des Arts, no. 269, December 2005, pp. 10-11 (another example illustrated). T. Kellein, Louise Bourgeois, La famille, Köln, 2006, pp. 134-135 (another example illustrated in color). M.L. Bernadac and J. Storves, Louise Bourgeois, Paris, 2008, exh. cat., p. 30 (another example illustrated). C. Claudel, Sculpture au Féminin, Limoge, 2009, exh. cat., p. 57 (another example illustrated). Paris, Musée du Louvre, Contrepoint 2: De l'objet d'art á la sculpture - Porcelaines contemporaines, December 2005-February 2006 (another example exhibited). The hybrid animal that is Nature Study underwent several variations in shape, size and material. In each case, Bourgeois admitted its peculiar and deeply symbolic form was a portrait of herself and her relationship with motherhood. The breasts hover protectively over the phallus, signifying the maternity's nurturing side. The breasts hover protectively over the phallus, signifying the maternity's nurturing side. "The phallus is the subject of my tenderness," she has commented. "After all, I lived with four men ... I was the protector." But similarly, she acknowledged the erect member's aggressive, demanding quality, stating, "Though I feel protective of the phallus, it does not mean I am not afraid of it" (L. Bourgeois, quoted in F. Morris and M-L. Bernadac (ed. ), Louise Bourgeois, exh. cat., New York, 2008, pp. 184-186). 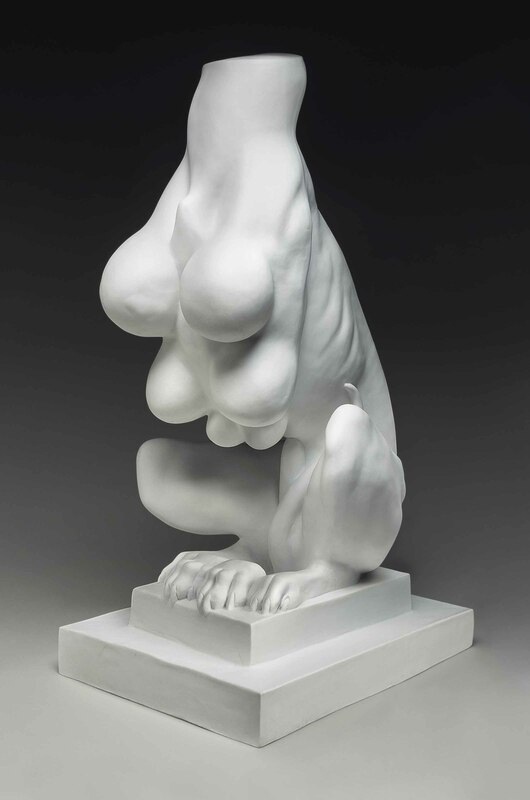 This sphinx-like sculpture evolved over a decade in a variety of different media such as plaster, red wax, rubber, marble, and in this particular instance, in Sevres porcelain. Bourgeois's art inextricably entwined personal experience and artistic expression. For over seven decades, she used sculpture to investigate projected psychological states. We can trace the roots of much of Bourgeois's imagery to her own life, particularly to painful childhood memories and the fraught terrain of femininity. She relentlessly tried to unearth and confront the deeply repressed issues that conditioned her youth, an effort that dominated her long career. Nature Study also draws on an enormous artistic legacy of metamorphic form. Harpy, satyr, minotaur, gryphon - the grafting of animal and human occurs throughout history. Sculpture has particularly lent itself to these fantastic beings, as its malleable materials give them real, three-dimensional form. Bourgeois spent her childhood immersed in the world of gods and grotesques at her parents' antique tapestry business and, as a young docent, she learned the Louvre from end to end. By the time she declared herself an artist, she was familiar with the shape-shifters of Symbolist art and began moving in Surrealist circles. Armed with this encyclopedic visual knowledge, Bourgeois has created her own hybrid monster-protector that evokes classical archetypes without being held hostage by them. The hermaphroditic body of Nature Study combines feminine and masculine eros, illustrating the inherently unstable relationship between love and destruction.